The self proclaimed champion of the world (and truth is, he probably is): Mr Satan! 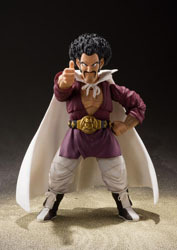 Renamed as Hercule Satan in the western world to avoid controversy, this comical character with looks that is hard to miss joins the SH Figuarts line! This figure captures his comical and boastful personality with the inclusion of his many signature expressions. Also included is Bee the dog to enrich your posing enjoyment with the Majin Buu figure. A must get, order today!